Thus, from the “Foreword,” Kim Stafford describes the place in 2009 where he met for a time with 15 “sterling companions” in a writing workshop they called the Outpost Writing Camp at Billy Meadows. Without electrical power or phones, many sleeping on the ground, the group immersed themselves in the writing craft for a week in a remote landscape, eating Dutch oven meals and exploring nature when not deeply engaged in writing. How to Sleep Cold is Stafford’s collection of 17 poems that were written at the Outpost Writing Camp, inspired by the writing prompts (also described in the book) that guided and inspired the group of participants throughout their time at Billy Meadows. The chapbook is both a collection of poems, and a collection of unique workshop prompts that could be adapted for similar purposes, and illustrated with several photographs taken by the poet. Letterpress printed in a limited edition of 500 copies, How to Sleep Cold is printed on Mowhawk Superfine paper, and folded and sewn by hand into Thai Chiri endsheets and Stonehenge wrappers. 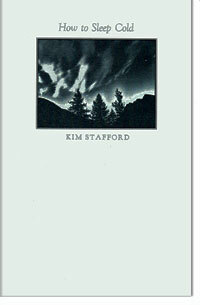 Kim Stafford is the current Poet Laureate of the state of Oregon. He grew up in Oregon, Iowa, Indiana, California, and Alaska, following his parents as they taught and travelled throughout the West. He is the author of more than a dozen books of poetry and prose, and the director of the Northwest Writing Institute and the William Stafford Center at Lewis & Clark College, where he has taught since 1979. He holds a Ph.D. in medieval literature from the University of Oregon, and he has worked as a printer, photographer, oral historian, editor, and visiting writer at a host of colleges and schools. His book Having Everything Right: Essays of Place, which won a citation for excellence from the Western States Book Awards in 1986, was reprinted in a special 30th anniversary edition in 2016. He has received creative writing fellowships from the National Endowment for the Arts, a Governor’s Arts Award for his contributions to Oregon’s literary culture, and his work has been featured on National Public Radio. He lives in Portland, Oregon, with his wife and children. $2o (plus $3 shipping). Letterpress printed limited edition, hand sewn in paper.